1807, Feb. Died, James SIMMONS, printer and bookseller at Canterbury, whose life is a striking instance of what may be effected by industry and perseverance. "Mankind" observes the writer of an account of the subject of his memoir, "are but too fond of contemplating heroes; and launching their admiration on exploits, which they can never hope either to imitate or excel." Knowledge, estimated with reference to usefulness, is only to be gained, nevertheless by an attentive investigation of the history of the middle classes of society, whose biography alone abounds with practical instruction. James SIMMONS, who afterwards sat in parliament for his native place, was born in an obscure part of the city of Canterbury, immediately in the vicinity of its cathedral, about the year 1740. His father (*William) was a barber (*perukemaker), whose circumstances were confessedly poor, although himself was of honest repute; and his son was educated at the King's School (*1749-55), in Canterbury, an excellent institution, which was founded by Henry VIII. 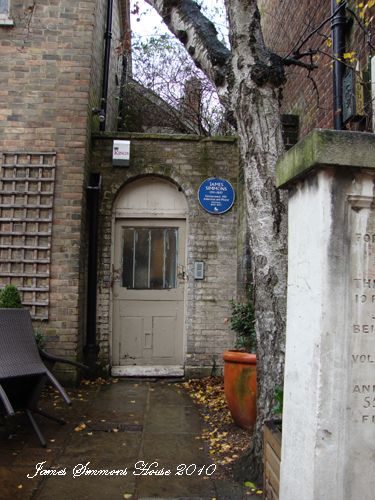 Being sent to London, while a boy, James became an apprentice to Mr. Thomas GREENHILL (*c. 1757), an eminent stationer, residing nearly opposite the Mansion house, but whose residence has since been converted into a banking house; thus, adopting the witticism of this gentlemen's biographer, "still keeping up, although not in its ancient firm, at least its ancient employment, stationers and bankers being both dealers in paper." Mr. Simmons, at length, entered into business on his own account when becoming a liveryman, he was shortly after put in nomination for the office of sheriff. This occurred twice, during 1802 and 1806; but it was represented that the state of his health would incapacitate him for sustaining the arduous duties which the shrievalty necessarily imposes upon those who undertake it. 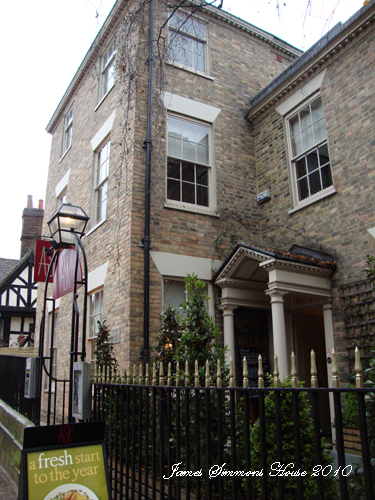 Notwithstanding, therefore, the advantages he might have derived by continuing to reside in the capital, Mr. Simmons, still panting for his native air, repaired, about the year 1768, to Canterbury, where he established a printing-office, with the management of which he had previously made himself acquainted. He was at this period the only printer in Kent. 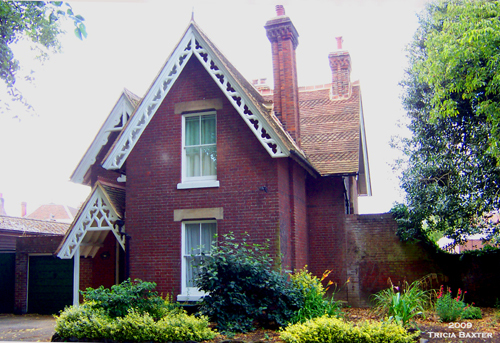 The foundation both of his celebrity and property, property being the consequence of real celebrity, was here laid by him in the publication of the newspaper entitled the Kentish Gazette. 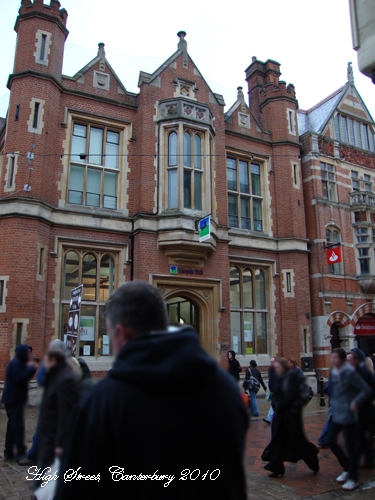 Before his time, the Kentish Post, or Canterbury News, was the only paper devoted to that extensive opulent county; it consisted of just four foolscap folio pages, containing two or three advertisements; and was adorned with a woodcut, that occupied full one-third of the first leaf. He could not but improve on such a plan. Introducing a new type, and a new taste, his undertaking at once succeeded. Mr. SIMMONS soon became the first stationer, bookseller, &c. in the city that gave him birth. Mr. Simmons was in politics a whig; and was, during the short period the Rockingham administration were in power, appointed distributor of stamps for the county of Kent; the emoluments of which, estimated as considerable, are known to have essentially contributed to his actual wealth. Declining, from prudential views, the contests of party, and having already filled the highest offices of his native place, Mr. SIMMONS turned his attention to objects of general and practical utility. 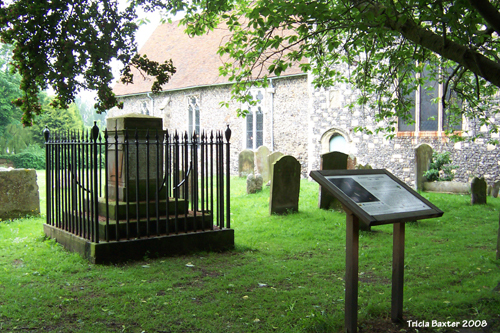 The first public act of this kind, in which this praiseworthy zeal became manifest, was the tender of his services to regulate the improvements agreed to be introduced into Canterbury; and such were the ability and attention evinced by him, especially as to the paving of the city, that he received the thanks of the corporation, accompanied with a piece of plate, of the value of £50. He was engaged in another great work. 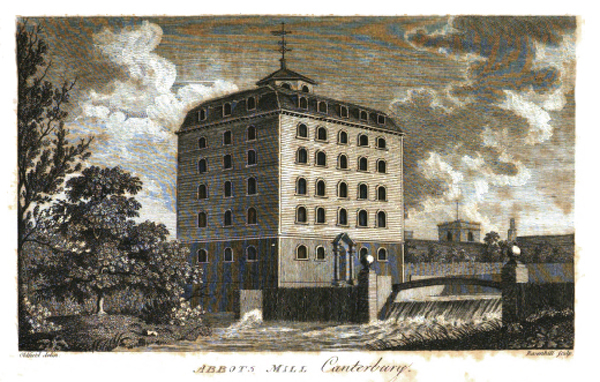 In 1794, Messrs. Simmons and Royle gave a premium of £2450 for thirty years lease of Abbot's and King's Mill; and they expended on the building, together with its improvements, to the amount of £8000 more. June 2, 1808 - The character which you have given of the late Mr. SIMMONS of Canterbury, in p. 177 of your volume for the year 1807, was such as he well merited. The piece of ground which belongs to the Corporation contains about five acres; the circuit nearly half a mile. 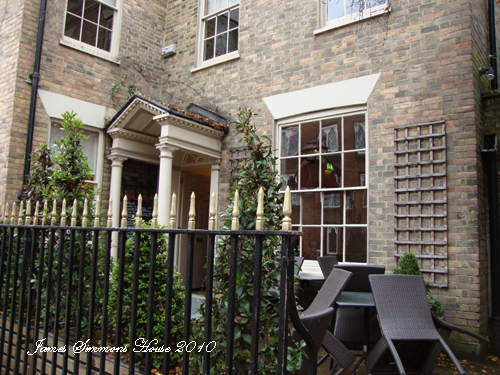 A terrace is carried along the side of the wall, within three or four feet of the top, so that it forms a parapet. It commands a view of the surrounding country. The ground was originally full of pits, was in the rudest state, and was in the rudest state, and was used for exercising horses, laying dung and rubbish, &c. The walks, in it and across it, which form a communication from one part of the City to another, are graveled, trees planted by the sides, and the grass kept in the nicest order. No horses or carriages are admitted. A gardener, who has the care of it, has a small neat house within it, in the Gothic style. 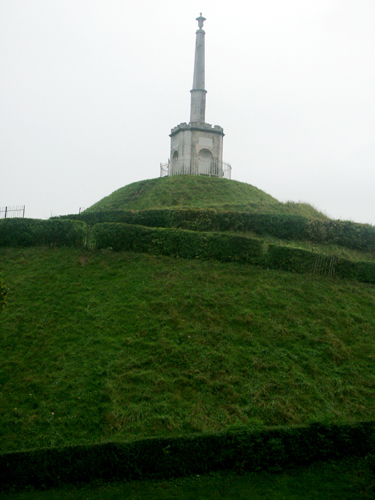 On the mount mentioned by Mr. Hasted, is now erected a square stone building, from which rises a column. The ascent to it is by an easy spiral walk; the building is inclosed by iron rails, and on each side is a seat for the accommodation of visitors, which is also of iron, not liable to be damaged by the folly of inconsiderate boys. The second only of the following Inscriptions was there, when we visited it; the other having been damaged by the frost, and having been taken down to be repaired; but we got a copy from the stone mason. 1. "This field and hill were improved, and these terraces, walks, and plantations made in the year 1790, for the use of the publick at the sole expence of James SIMMONS esq. of this City, alderman and Banker. To perpetuate the memory of which generous transaction, and as a mark of gratitude for his other public services, this Pillar was erected by voluntary subscription in 1803." 2. "The Mayor and Commonalty of this antient City, in consideration of the expensive improvements lately made in this field, unanimously resolved, in 1802, to appropriate the same in perpetuity to the use of the publick, and to endow it with sixty pounds a year, for the maintenance and support of the terraces, walks, and plantations, payable out of the Chamber." The horse-barracks adjoin to this field on one side, and near them is an open seat, covered at top, like the musick-gallery at Vauxhall, in which the band of such regiment as happens to be quartered in the town, often entertains the company in a summer evening. 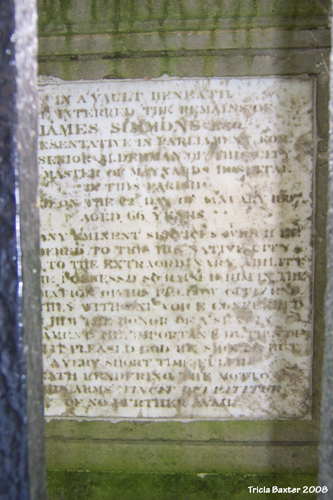 James Simmons was the son of a barber and was born in 1740 in an obscure part of the city. He was educated at the King's School, and subsequently apprenticed to Thomas Greenhill, stationer, of London. In addition to founding the Kentish Gazette Simmons was appointed distributor of stamps for the County of Kent, and in company with Kirkby established about 1780 a circulating library at the Kings Arms Printing Office, with a reading and newspaper room, the terms of subscription being : To the library-Reading Room and Newspapers by the year 1 lls. 6d. Half year 17s. Quarter 9s. six weeks five shillings. To the Reading Room and Newspapers only by the year 1 Is. Half year lls. Quarter 6s. To the Library only by the year 1 Is. Half year lls. Quarter 6s. [Advt. in the Kentish Gazette]. 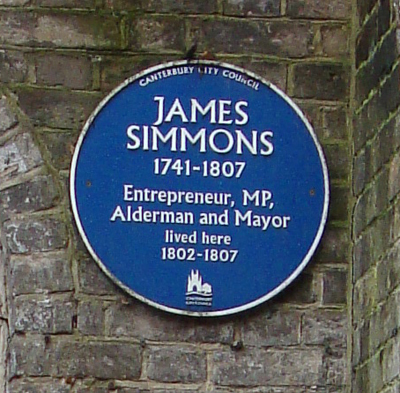 James Simmons served the respective offices of Alderman, Mayor and Member of Parliament for Canterbury, and undertook several city improvements, most notable of all being the laying out of the Dane John Gardens. He died at Westminster on Thursday January 22nd, 1807 in his 66th year. 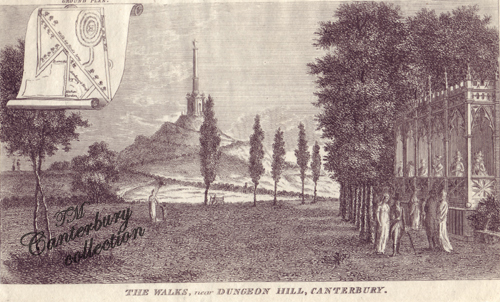 Amongst notable books printed and published by the firm of Simmons & Kirkby was the first edition of Hasted's History of Kent, 1778 and the same authors History of Canterbury, 1799. The churchyard contains one monument, which the citizens ought, out of gratitude, to take under their charge. It is the tomb of worthy Alderman Simmons, who, at the beginning of the present century, converted what was then known as the Dane John Field, into a beautiful garden and recreation ground for the citizens. This he did at a cost of £1500. We read on his monument (which much needs some "Old Mortality's" loving hand to set it in order) (see below). The Alderman died in 1807. Many eminent services which he rendered to this his native city. To the extraordinary ability that he possessed, so raised him in the estimation of his fellow citizens, that they, with one voice, conferred on him the honor of a seat in Parliament, the important duties of which it pleased God he should but a very short time fulfil. Death rendered the motto of his arms "Vincit qui patitur," Patience wins"